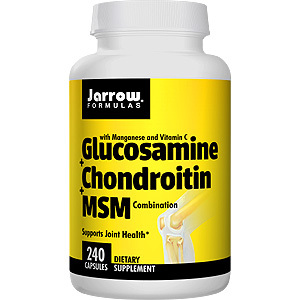 Glucosamine + Chondroitin + MSM Combination provides efficacious quantities of Glucosamine Sulfate, Chondroitin Sulfate, and MSM combined with Vitamin C and Manganese for optimizing joint health. as a major component of connective tissue in the skin. Methyl-Sulfonyl-Methane (MSM) is an organic source of sulfur, an antioxidant mineral and critical component of structural body tissues such as cartilage. The sulfur from MSM is incorporated into joint tissues as glycosaminoglycans (or mucopolysaccharides) such as chondroitin sulfate and hyaluronic acid. Take 4 capsules per day, or as directed by your qualified health consultant. Do NOT use if allergic to shellfish. Other Ingredients: Magnesium stearate. Capsule consists of gelatin. Contains NO other ingredients. Contains: Shellfish (shrimp). This has really helped me relieve pain from my joints. I know feel so much greater as the pain from my joints has been relieved. Glucosamine + Chondroitin + MSM - is shipped in a discrete, unmarked package. Orders are processed immediately and usually take about 3 to 5 working days to be received. We do ask that you try it for 2 to 3 weeks to feel the full effects. Any information received is used only for order processing and shipping purposes. Your information, such as e-mail address, will never be disclosed to a third party.